My Adirondack chairs were looking really bad. 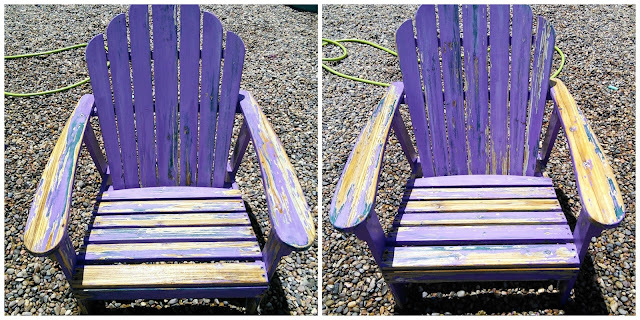 The paint was chipping off the chairs and the wood was worn out. So I decided to shop around for some new chairs for my yard. At first, I thought that I wanted some chairs in a different material, like metal, that could withstand the dry heat of New Mexico. 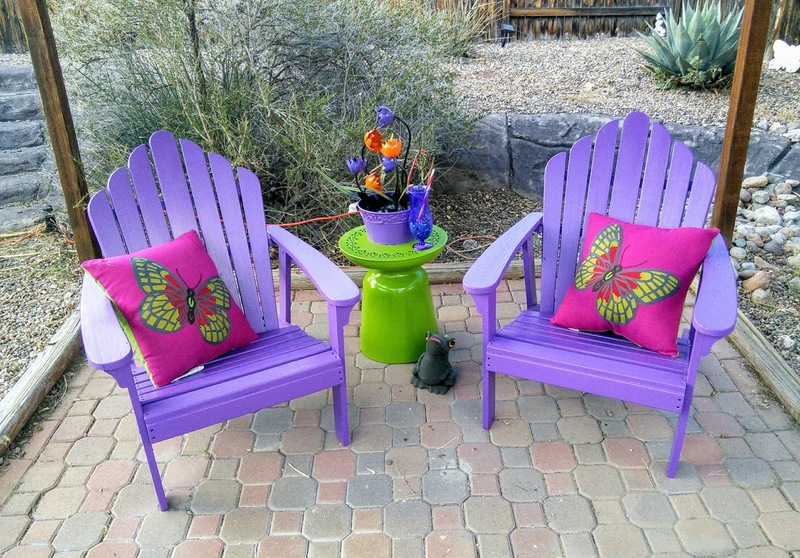 The problem was I could not find anything that I liked and I loved my purple chairs. 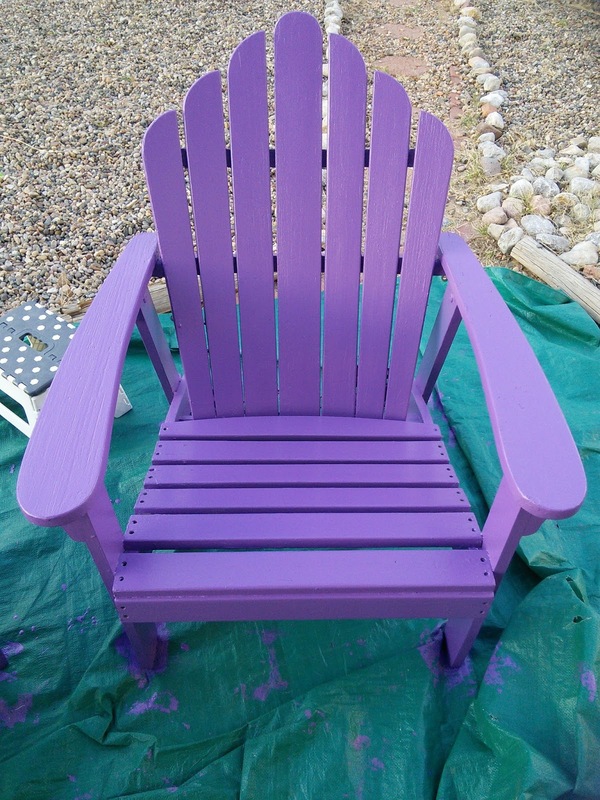 So I then decided to just replace them with new Adirondack chairs and I found out they were pricey, about 125.00 each and they were not purple! When the boys and I went to Lowes last week, I found some purple Adirondack chairs at a great price but they were made of plastic. I almost bought them until I remember that my last plastic chairs broke after the wind blew them over. 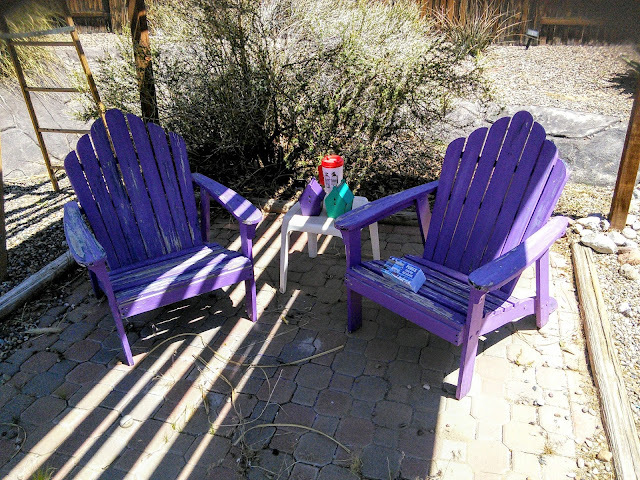 We tend to get a lot of windy days here so I decided to not spend $40 on those cute purple chairs and instead I decided to take that money and buy the materials that I needed to make my old chairs look new again. Sponsored Post: I received a Pumice Stone to facilitate this post. 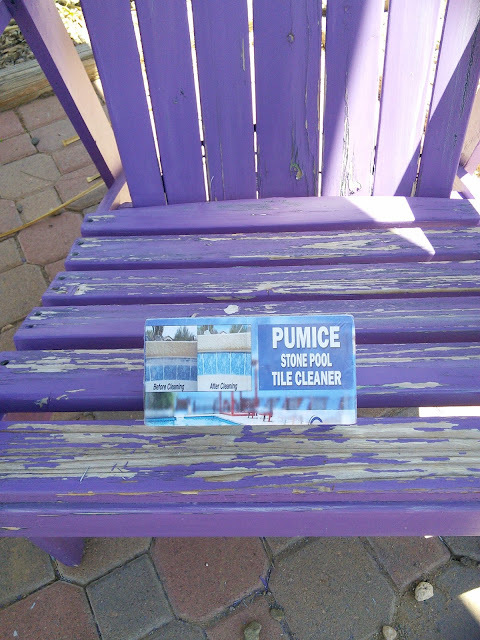 All I needed to buy was paint, in purple, of course, some pumice stones, and a paint brush. The materials cost me $40 and that was only because I bought a gallon of paint. I could have easily only used a quart of paint, should have listened to the paint guy. Anyone need a half gallon of purple paint? Once I started to work on my chairs, I realized the wood was still in great shape and all my chairs needed was a good sanding and a couple coats of paint. Sanding the chairs was easy. I discovered that pumice stones work way better than sandpaper. 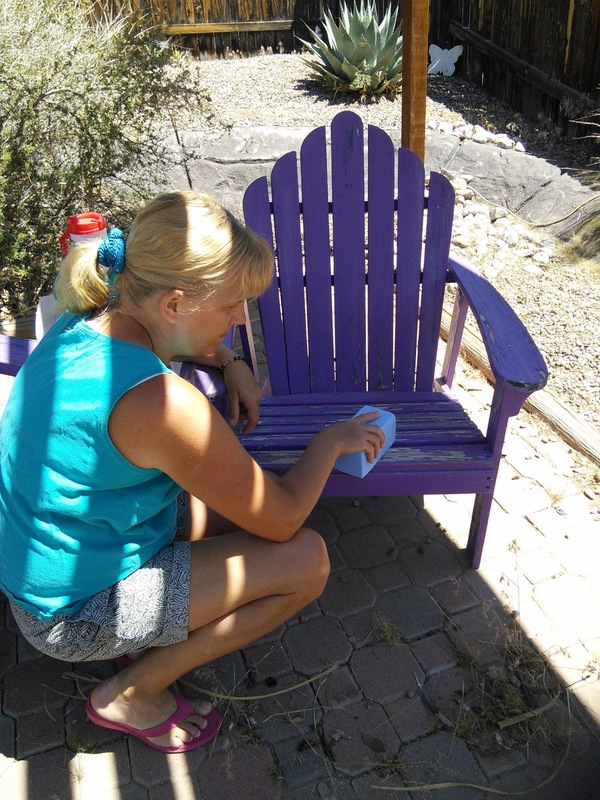 The stones are easy to hold in my hand and worked great to remove the old paint off my chairs. The large size of the pumice stone covered a bigger surface at one time. When you use sandpaper it needs to be folded or placed around a block and sandpaper tends to wear out fast. The pumice stones seem to last longer. My boys even helped me with the paint removal. 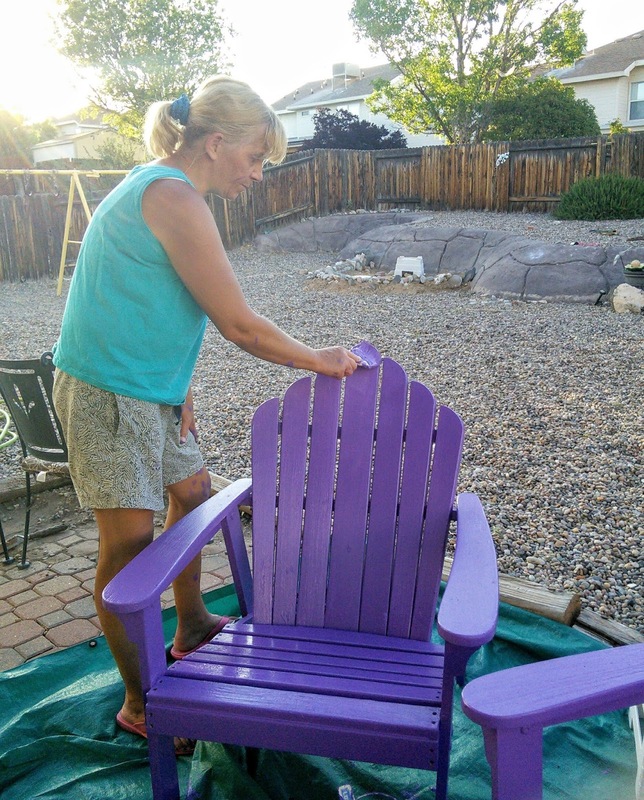 Since I was painting the chairs the same color, I only needed to get the uneven pieces of paint off the chairs and smooth the wood out. That took me a couple of hours. I then rinsed the chairs and set them in the sun to dry. Once the chairs were dried, I placed the chairs on a tarp so the paint would not get on my patio. For some reason, my husband did not want a purple patio. I then open the can of paint and stirred it up. I just love that shade of purple! I could have used spray paint but that would have cost more money. I then painted the chairs with a couple coats of the paint, making sure to allow the first coat to dry thoroughly before applying the next coat. I am so pleased with my restoration of my Adirondack chairs! Sure it took some time but I save over $250, the price of new chairs. The chairs look so beautiful in my yard. With the money, I saved I was able to buy some awesome items to complete a wonderful sitting area. In fact, all the items I purchased cost me about $250! I am so glad I chose to spend a day of sanding ( the pumice stone made it easy) and painting as it was so fun buying all the items for my new summer area. If I had bought two new chairs, I would not have had any money to buy anything else and all I would have had was chairs. The items that I purchased for about $250 were the pillows, green table, flower fountain on the table, the two flower pots, plants, dirt, paint, a brush, and the Pumice Stone. 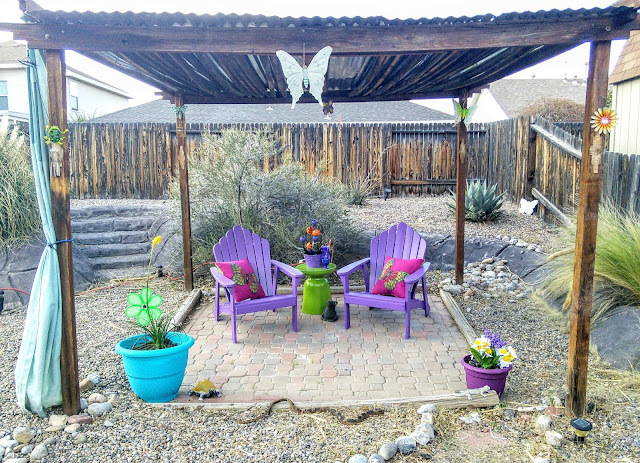 I am so pleased with my new summer area in my yard. My boys even told me that my chairs look like new. This restoration project has me inspired to do another project. How colorful and purplicious. I'd like to make a pair of these for the grand kids to put on my patio. I can't wait to see how they turn out. What a fantastic job! I love the color as well. It looks great! I love the way yours came out. The color is so vibrant. I love the fun purple colour! How awesome, and they look brand new that is perfect to keep your furniture. You did such a great job on these! I love the color too and they make a great pop of color in your yard. I have on old wooden bench on my porch that needs a redo and this inspired me to get it done while the weather is nice. I love that you don't have to spend much to restore a furniture! This looks amazing and I love the color that you picked as well. Wow! You really turned those chairs around. I love being able to restore things like this. The purple color and the area you set up is cool! These chairs look amazing. I have a few pieces from last summer that need a cleanup and a coat of paint. It will be a great project to do this weekend. You chairs look amazing! I had no idea you could use pumice stones for so many household tasks! They look great. You made it look so easy. I would try to redo furniture. Oh how beautiful are these chairs! I just love the rich bright purple hue you opted for. Will be trying this over the summer. I so love your purple chairs! The sitting area came together beautifully. Even the throw pillows were an awesome choice. This is the first time I heard of using pumice stones to clean hard water stains. I have to get some of those too. I think this is genius. You transformed the chairs into a lovely space in the yard. Great idea, I have a piece that needs a little love. You inspired me.